There are 4 posts tagged pedagogy (this is page 1 of 1). Last week I had the pleasure of giving a talk at one of the Institute of Social Studies‘ educational lunch sessions. In one and a half hours I talked about free software in general, about the things that make Moodle a great project (in this case mainly its philosophy and its license) and about how Moodle can be utilised best in tertiary education. If you already know about free software and Moodle and are only interested in practical ways of using Moodle in your courses, start at slide 52. Feedback is more than welcome as always! About a month ago I got an email from Packt‘s marketing department whether I would be interested in receiving a review copy of William Rice’s Moodle 1.9 E-Learning Course Development. I said “yes”, so in the interest of full disclosure: I received a free copy of this book. As Packt also publishes a couple of other books on Moodle, I have decided to review these as well. So what does one expect from a Moodle book? I think the spectrum that these book try to cover runs from technology to pedagogy. You want to know how to install Moodle on a server and make it run well, but you also want to know how best to use the tools in Moodle to achieve your teaching/learning goals. The easiest way for me to decide whether a book on Moodle is any good is to look at the topics that are notoriously hard for new Moodle users to understand: roles, the gradebook, groups/groupings and metacourses. I will look at each book in turn and give a short description of the book and what audience it is for, then look at each of the difficult Moodle topics and how they are covered in the book. Finally I will look at the pedagogical/didactical ideas in each book. Roles are explained in the last chapter of the book. Rice does a decent job and does explain how you can override permissions for a single activity. Everybody should heed to his recommendations for working with roles (basically: start with the default system and only tweak when you actually want to change the default behaviour). I wish he would have put a chapter on roles in the beginning of the book so that he could have explained later on how you can allow students to rate each others forum posts for example. Currently the explanation on how to let students rate posts is not correct, the screenshot seems to come from an earlier version of Moodle. Rice used a beta version of Moodle 1.9 for writing this book. Apparently the current 1.9 gradebook wasn’t there yet, because the functionality that he describes only fits Moodle 1.8. This is a big omission: don’t expect to get any help on grading in the current version of Moodle from this book. Groups are only mentioned when the course settings are explained (I couldn’t find groups in the index of the book). The concept is explained properly, but Rice does not go into the technicalities. Groupings are not discussed anywhere. The concept of a metacourse is explained with a useful example making it clear for the reader for what it can be used. Rice only explains the first scenario from the Meta Course page on MoodleDocs. The second scenario, which can be genuinely useful too, is not explained. Finally, the book gives scant pedagogical support. It has headings like “Why Use a Directory?”, “When to Use Uploaded Files” and “When to Use the Different Types of Surveys”; but these are few and short. It will not be easy for a new Moodle teacher to grasp the larger concepts on how he/she could use Moodle. 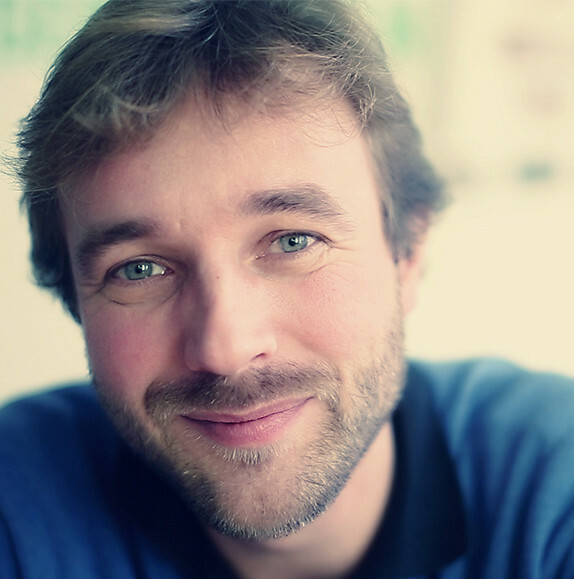 Moodle Administration by Moodle partner Synergy Learning‘s Alex Büchner is for “technicians, systems administrators, as well as academic staff, that is, basically for anyone who has to administer a Moodle system”. 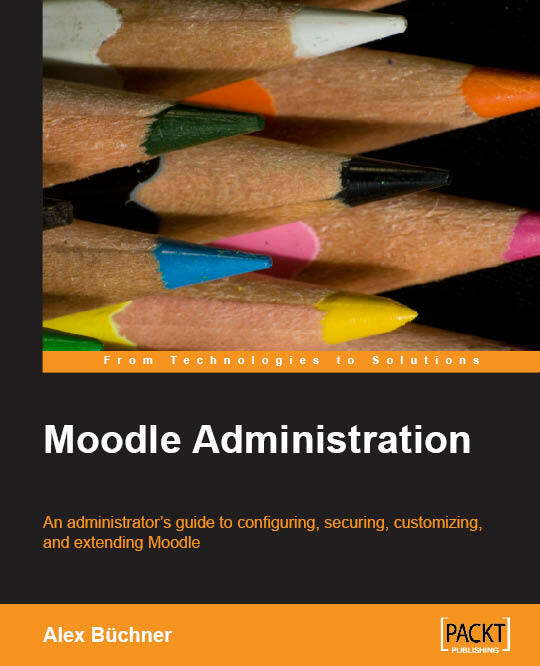 It is a big book (350 pages or so) trying to systematically cover all the relevant topics for an administrator using Moodle 1.9 (using the Moodle Admin menu as a guide). The depth of this book is actually quite amazing and I think there is no quicker way for a person with a technical (meaning non-teaching) Moodle related role to get up to speed. For example: Nowhere else can you find information on Moodle networking that is this extensive. My favourite chapter is Appendix A, the Moodle Health Check. This is a set of over 120 tests related the performance, functionality, security and the system. Each test is linked back to the chapter which describes the actions you should take in more detail. If you follow all the advice you should end up with a healthy Moodle installation. Roles (and permissions) have their own chapter in this book. It clearly describes the different contexts and permissions. It explains how permission conflicts are resolved and has an example of the non-standard parent or mentor role. The paragraph on best practice is a must read for anybody wanting to touch the role system. Unfortunately the gradebook, groups and groupings are not discussed in this book. Even though strictly speaking it is not administration, I think it is important that any administrator really knows these topics so that he/she can help their teachers. Maybe something for a next version of the book? The concept of metacourses is explained properly and describes both ways of sharing enrolment across courses. The book has no pedagogical support, simply because it isn’t aimed at a teaching audience. Moodle Teaching Techniques is a slightly older book by William Rice (2007). 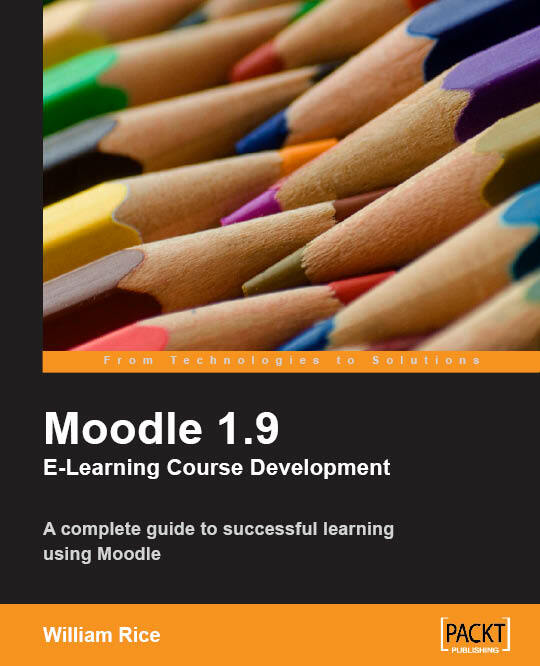 The subtitle “Creative Ways to Use Moodle for Constructing Online Learning Solutions” conveys the aim of the book: provide the reader with solutions that help you make the most of the many features found in a standard Moodle installation. The book starts with a chapter explaining some general well accepted instructional principles (e.g. Big Ideas, Distributed Practice, Guide Notes). These principles are then coupled with different Moodle features. The book then has a chapter on each of the most used Moodle modules. The chapter on the forum module for example, describes how to create a single-student forum, how to motivate students to interact with a “best of” forum, how to keep discussions on track and how to monitor student participation in a forum. 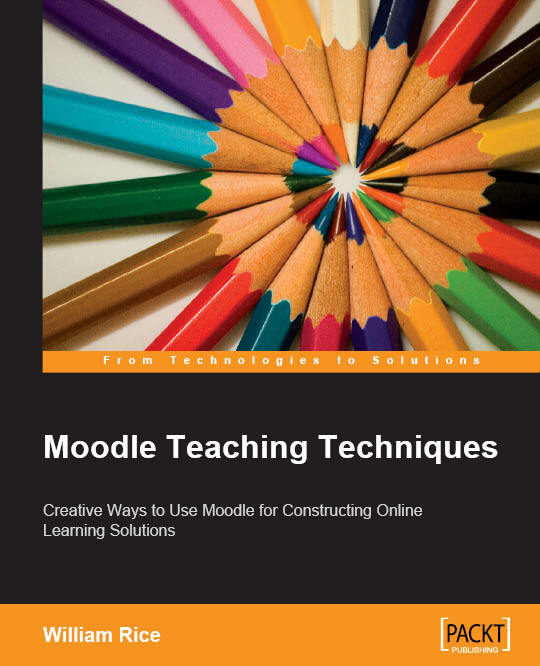 Even though the book is written for Moodle 1.6, I would still recommend it to anyone who wants to be more creative in their Moodle teaching practice. A lot of the advice in this book can even be used in other virtual learning environments. Roles and the 1.9 gradebook are not discussed (they didn’t exist in Moodle 1.6), groups are used in some of the examples, grouping and metacourses are not written about, but the pedagogical support of this book is great. I really wish more people would attempt to write a book like this. 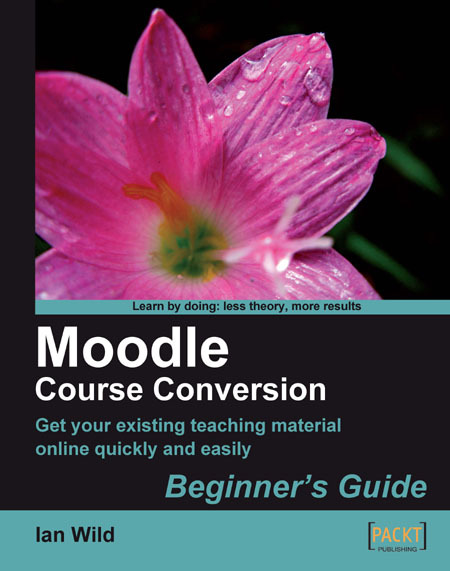 If you are a teacher, lecturer, or trainer faced with using Moodle for the first time and you want to convert your teaching materials to Moodle quickly, effectively, and with the minimum of fuss then this book is for you. You may have toyed with the idea of using Moodle but you are not sure how to begin converting your face-to-face teaching online. If so, this book will show you how to create engaging and entertaining online courses. You may need to support your face-to-face teaching with online activities, including assignments and tests. In this book, we get you started with blended learning. Wild has an entertaining style of writing and uses the most recent version of Moodle. The book is very hands-on with a lot of examples on how you would start putting materials online. Many teachers want to know how they can put Powerpoint presentations online, or how to convert a big document into a readable wiki. He is very tuned into what teachers would like to do nowadays. I especially like his paragraph on how you would embed a video from YouTube or TeacherTube into Moodle or his explanation on how to find images for your course (with a short chapter on copyright and a single mention of Creative Commons in the paragraph on Flickr). Roles are only written about in a paragraph on assigning students and teachers to your course. The concept of a meta course is not explained. However the gradebook has some great paragraphs dedicated to it. Wild shows how you can add your own categories, move grade items into these categories and create your own grade items. It is a pity that he doesn’t go into the different aggregation options for these categories, because this is often the hardest part to understand for a new teacher (is the Moodle project sure that “Simple Weighted Means” is the best way of saying that the total course grade is the average of all grade items/categories?). Groups and groupings also get a proper explanation. There is quite a bit of pedagogical support in this book. If you follow Wild’s advice you will end up with a significantly better course than most of what I currently see in the learning field. The book has some nice ideas that any teacher can follow up, however please note that most of these seem to be geared to secondary education. To conclude: For teachers I would definitely recommend Moodle Course Conversion: Beginner’s Guide. Administrators should read Moodle Administration. Read both books if you want to understand roles, the gradebook, groups/grouping and metacourses. I do think there is space for another Moodle book. Where is the author that starts with a social constructivist concept of teaching (we don’t currently have this in most schools, universities and businesses) and explains how this vision can be created with practical integrated Moodle activities? Packt believes in Open Source. When we sell a book written on an Open Source project, we pay a royalty directly to that project. As a result of purchasing one of our Open Source books, Packt will have given some of the money received to the Open Source project. In the long term, we see ourselves and yourselves, as customers and readers of our books, as part of the Open Source ecosystem, providing sustainable revenue for the projects we publish on. Our aim at Packt is to establish publishing royalties as an essential part of the service and support business model that sustains Open Source. Their tagline really fits the title of my blog: “From Technologies to Solutions”. Firstly please let me apologize for the delay in shipping the book to you. 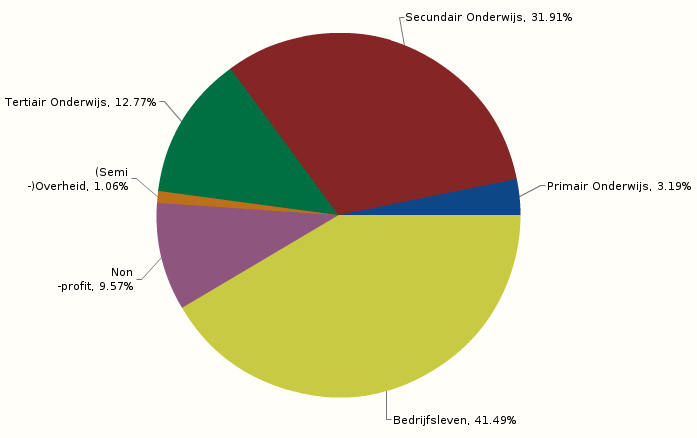 Usually all postal shipments to ‘ Netherlands’ are delivered within 18 days maximum. It appears that there is some delay in the shipping process. Since your book was shipped out via Royal mail ordinary post, it is untraceable. However you need not worry, kindly email us if you do not receive your book by the 16th of January, I’ll be glad to help you. For all the trouble this has caused you, I have placed a free eBook of ” Moodle Course Conversion: Beginner’s Guide” in your account. You can access this eBook immediately and meanwhile your print book should be on its way to you. There is one thing I would love Packt to change: their layout/typesetting. When I read their books I get the feeling that MS Word was used for creating all the pages. I would love it if they would invest in some typesetting technology that would make the layout look less amateurish. If anyone at Packt is reading this, I would be happy to receive any of the following books for review: User Training for Busy Programmers, AsteriskNOW, PHP Web 2.0 Mashup Projects, ImageMagick Tricks, Mobile Web Development and WordPress for Business Bloggers!